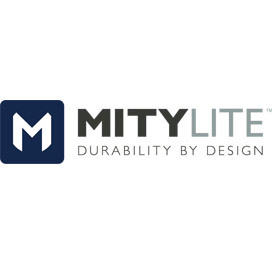 Mity-Lite has been manufacturing world-famous folding tables and folding chairs for 25 years. Their lightweight, but durable furniture products have serviced the educational, worship, government, hospitality and business-to-business market. Many public assemblies use Mity-Lite ABS plastic folding tables because they are strong enough to hold excessive wight, but are lightweight enough to be moved and stored with ease. Their lightweight folding tables have several leg options and can be purchased with standard textured tops or smooth tops in several colors. For lightweight seating solutions, Mity-Lite's Mesh-One folding chair has a contoured mesh seat and back for lasting comfort, while being strong enough to have a 1000 pound weight capacity! Mity-Lite's folding chairs are available in two colors and are a snap to open and close for fast set-up at large special events. For storage, choice one of several Mity-Lite table carts avoidable to transport and store your facility's folding tables. Mity-Lite has a 12 year warranty on their folding tables, and a 10 year warranty on their Mesh-One folding chairs- both are now Greenguard Indoor Air Quality Certified.